This week’s minorities in cartoons entry is Seraph (real name: Chaim Levon), a superhero in DC Comics. 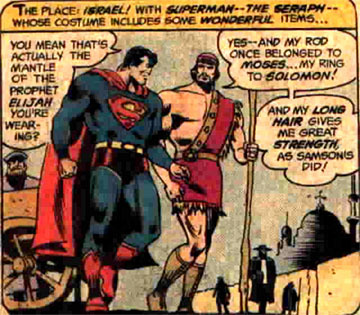 Seraph first appeared in “Super Friends” #7 (October 1977). Chaim was created by E. Nelson Bridwell and Ramona Fradon. Seraph was created for the “Super Friends” tie-in comic in the late 70s as part of an effort to add some diversity, by showing superheroes through the rest of the world, not just America. Given the comic was written by DC’s usual staff, it lacked the flaws of the TV show (violence restrictions, forgetting whether the Flash could fly or not, etc.). Thus, it ended up being a lighter version of their “Justice League of America” comic. For awhile, DC claimed the “Super Friends” comic took place on Earth-1 alongside the regular JLA book, but later decided it was apocryphal. However, many of the characters created for the “Super Friends” comic ended up in the regular DC Universe anyway. The ring of Solomon, giving him the power of wisdom and teleportation. The staff of Moses, which can transform into a serpent and allows Seraph to manipulate water. The mantle of Elijah, which provides invulnerability. Seraph also had long hair, which he felt provided him with super-strength like Samson. Chaim would also show some religious beliefs, occasionally praying to a “higher power” for assistance. Seraph appeared in his own series of backup stories in the “Super Friends” title, but never in the TV show itself (or any other non-comics media). Seraph eventually appeared in the DCU proper, in “DC Comics Presents” #46 (June 1982). There, he joined the Global Guardians, a superhero team made up of heroes from all over Earth. Seraph also appeared post-Crisis, where he formed a new version of the Global Guardians after the original suffered casualties.